This November we will be traveling to Walt Disney World! I have never been, and obviously neither have the girls. RJ has been a number of times but it has been years since his last visit. We are so excited we cannot contain ourselves. I thought I would share a bit about our trip and the amount of planning a trip to Disney requires. Disney does A LOT online these days. It’s really cool. The app and website are all integrated. There is now something called “magic bands”. Magic bands are electronic bracelets, they can be linked to your tickets, photopasses, fast passes, dining plans, and hotel room keys (if staying on Disney property) etc. They can be personalized, and special edition bands are available at special events, it’s really cool! 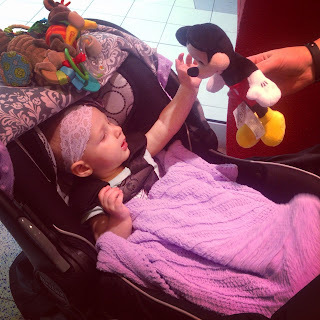 Rose about six months old receiving her first stuffed Mickey. We chose to stay at a Airbnb instead of a Disney resort for a few reasons. Space, and cost being the biggest. Our Airbnb is a three bedroom condo about a 15 minute drive to Disney. It is only costing us 79 dollars a night. A three bedroom suite at disney would cost upward of 500 dollars a night. Going to Disney as a family we will probably never stay onsite. We like our space, but we do not enjoy paying an arm and a leg for it. 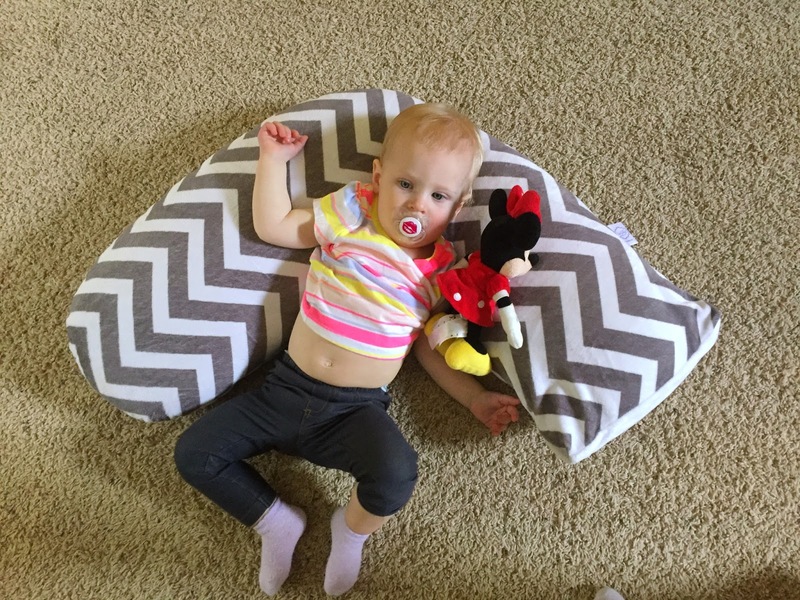 There is something about being able to go back to a house like place with space to relax and wind down, rather than being cramped into a hotel room (especially with two toddlers). We are bringing our babysitter with us. We wanted an extra set of hands. We met her through Care.com but at this point she is a really good family friend. She watched Rose part of the time when I gave birth to Heather. She babysits for us regularly and Rose loves her. Heather is still warming up. Heather doesn’t like to be left with anyone at this point, but I’m sure after an entire week with us, Heather will love our sitter too. RJ and I can get a small vacation from the kids thanks to our sitter. We have a nice dinner reserved, and purchased late night party tickets for the two of us. We are really excited. Not to mention we will be able to ride big rides together and not have to ride alone while one of us sits with the children. We are long time Hertz members and I had a ton of points. We are renting a minivan for two full weeks for a fraction of the price and I only used half my points. I recommend always renting a car. The money spent will be worth the money you save avoiding extra wear and tear on your personal vehicle. Also, if it breaks down someone will find you a replacement vehicle. You will not have to worry about being ripped off by a dodgy mechanic because you have out of state plates. Trust me, rent a car. I have learned a few little tidbits about Disney as we have been planing. You can bring outside food into the park. You do NOT have to buy expensive park food. We plan on packing lots of snacks and maybe even lunches on a few days. We bought a small/medium soft sided cooler that we plan on stowing under the stroller. You can get a cup of water anywhere that serves food/drinks at Disney for free. At guest services you can get special pins. We will be there on Rose’s birthday so we will be getting her a pin that day. It also happens to be Mickey’s birthday so we are hoping it’s extra special. We already have a Disney addict! After doing a ton of math we decided to buy one of us an annual pass. Annual pass holders get free parking, and free photopass services. That alone is 300 dollars. You get discounts on event/party tickets, food, and merchandise at the parks, as well as a number of other discounts. We will very quickly save the extra money we spent on an annual pass, and more. Only one person in your party needs to have an annual pass to get most the discounts. Buy tickets for as many days as you will be there. We will be in Florida for 7-8ish days. I’m not really counting the day we check in because after a 8 hour drive including stops, we will not want to go to the parks that evening. However we are going to go to Disney springs to pick up magic bands, and activate our tickets. We will be in Florida for the next 7 days. After reading lots of blogs and planning we debated how many days of tickets we should buy, 5,6, or 7. A few bloggers mentioned if planning a week at Disney you should plan rest days. Not go to the parks at all one or two days. With two little ones this sounded like a really good idea, but the longer we looked at ticket prices the thought of not buying 7 days of tickets was getting more and more silly. One adult 5 day park hopper ticket costs (on average) $409. One adult 7 day park hopper ticket costs $439. That’s right only 30 dollars for an extra TWO days at Disney. Even if we do stay home one or two days, or if we have a few half days, I will not feel like we wasted any money. Buy tickets for every day you can. It’s impossible to do everything at Disney unless you have unlimited time. I know this will not be the last time we go. We will not be disappointed if we miss something. Taking it easy and planning a few things but not having our schedule jam packed will be much more fun and less stressful. We will do what we can and ride Roses favorite ride 10 times in a row if that’s what she wants to do. The goal is to enjoy ourselves and our vacation, not plan ourselves to death. We cannot contain our excitement! This will be our first official family vacation and I am soaked. Thanks for reading! I cannot wait to share about our trip in a month or so.